Jennifer Higdon Interview with Bruce Duffie . 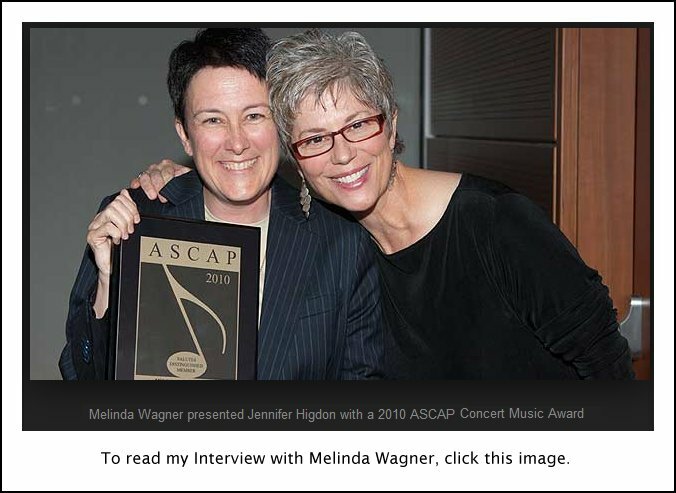 . . . . . .
Born in Brooklyn, N.Y., but raised in the South, Jennifer Higdon received a Bachelor of Music from Bowling Green State University in Ohio, a Diploma from the Curtis Institute of Music in 1988, and an M.A. and Ph.D. from the University of Pennsylvania. In addition she has studied conducting with Robert Spano and flute with Judith Bentley. She joined the faculty of the Curtis Institute in 1994. She is the recipient of the 2010 Pulitzer Prize for Music for her Violin Concerto, a 2009 Grammy Award (Best New Contemporary Classical Recording) for her Percussion Concerto, a Guggenheim Fellowship, Pew Fellowship, a Koussevitzky Fellowship, and awards from the American Academy of Arts and Letters. 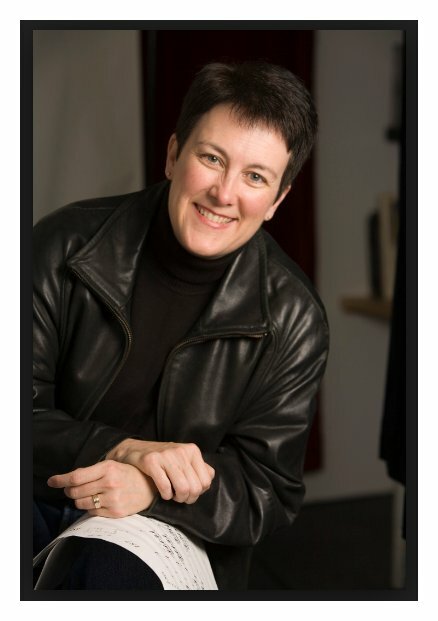 Her works are performed around the world, with commissions coming from a variety of ensembles and individuals, such as the Philadelphia and Cleveland orchestras; St. Paul Chamber Orchestra; Gary Graffman; Hilary Hahn; the President's Own Marine Band; Tokyo String Quartet; Time for Three; Philadelphia Singers; Mendelssohn Club; eighth blackbird; and Opera Philadelphia and Santa Fe Opera. She has works on more than four dozen recordings, including the Grammy-winning Higdon: Concerto for Orchestra/City Scape. It is always interesting to catch someone early in their career, especially when the promise of youth blossoms into full-blown success. 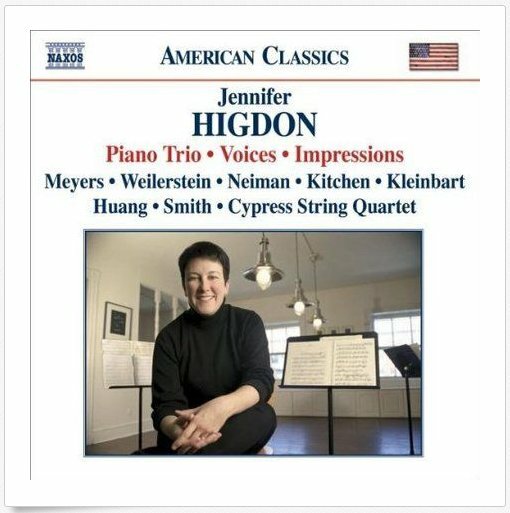 I met Jennifer Higdon on Valentine’s Day of 2004, when she was in Chicago for a performance of one of her chamber pieces on the MusicNOW series, which is an adjunct of the Chicago Symphony Orchestra and includes some of their members along with a few guests. Her career was well on its way even then, and it got an additional boost in 2010 when she won the Pulitzer Prize. Since that time, she has continued apace, with performances and recordings in significant numbers. So this conversation reflects her as she begins to blossom, and shows, perhaps, how she emerged to the success she is today. Throughout our conversation, she was bubbling with enthusiasm and showed a kind of self-amazement about the whole business. Bruce Duffie: You mentioned that you were starting to write something for junior high band. Is it particularly difficult to write something interesting that is not technically challenging? BD: Is it your responsibility to make it interesting to them, or is it your responsibility to make something that will become interesting? JH: Actually, probably both. That’s a good question. 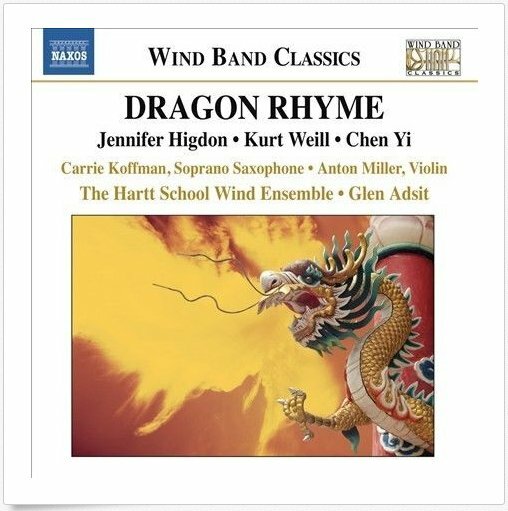 It’s funny; the whole idea behind this Band Quest series is that they’re trying to get established composers — people like Chen Yi and Michael Daugherty — who normally writes orchestra music to try writing something for band, but something that will communicate to a much younger group. It is really amazing how difficult it is because you write something, you look at it, and you wonder if it is going to work, or if they can play it. To me it looks simple, but I realize with all the training that we go through, it’s a different prospect for a junior high group! [Laughs] Oh, boy, is it! BD: In general you get a lot of commissions. How do you decide, yes, I will to do this one or no, I will turn that one aside. JH: Totally gut instinct. It actually is completely gut instinct; just what sounds like it might be interesting to work on. It has no logic. I have to say when a really good group — like the Philadelphia Orchestra — comes to you and they say, “We want to commission you,” of course your brain goes oh yeah! [Both laugh] There’s not much thinking in that. But you do have to learn to balance it, because this past year I went through eleven commissions, which is a lot. BD: That’s almost one a month. JH: That’s about right, and that was a little too many. I said no to a lot of projects, but things kept coming up that just sounded so interesting that I couldn’t say no. BD: I would assume it takes you more than a month to do each commission? JH: Yes, but it depends on the piece. Some of the commissions were for shorter works. I had this commission for the Gilmore Piano Festival, and I guess they were little short snippets. It was based on the idea of the theme of the Goldberg Variations by Bach, and they wanted everyone to do a variation. So something like that is very different than writing a full piece. I wrote two string quartets and a piano trio this year. One of the string quartets was thirty minutes, so that took a couple of months. In the month that I did actually the Gilmore piece, I think I did two other short pieces. So they kind of bunch up, but some of them take longer. BD: You work on more than one piece at a time? JH: No, I don’t. I’m always thinking ahead. That’s what it is. In the actual writing process I’m only working on one, but my brain is processing the next piece down the road. BD: I would think it would be good, though, to have the next piece in mind, so that if you come up with an idea that doesn’t work in this piece it might go in the next piece or the piece after that. BD: As someone who worked night for years, I’m glad to welcome you aboard! JH: Yes. It’s a good creative time. BD: Absolutely, and it’s very quiet. JH: Absolutely, yes. It’s pretty amazing. BD: You don’t have to mention the name, but do you know the singer? JH: Yes, actually. It’s Eric Owens. BD: Is it better to know which singer will be doing it? JH: Yes. I like to know the ensembles, the musicians I’m writing for, or if I can get to know the individual musicians and the singer. I know Eric from Curtis. He went to Curtis there, and I saw him last year doing John Adams’ El Nino in Atlanta. Eric and I talk occasionally and I thought, wow, what a voice he has! Brooklyn requested Whitman texts because it’s an anniversary, and Whitman has such a connection to Brooklyn. So somehow Eric seemed very logical. I don’t know, for Whitman it seemed just his voice type. BD: When you write for a specific voice, that doesn’t preclude it from other voices or other artists? JH: No. I get that question a lot because my Concerto for Orchestra, which was written for Philadelphia, was so tailored for the orchestra. But nine other orchestras have done it. People have been asking what it’s like hearing Dallas do it, or Milwaukee, and it is different, but it works. It does work. BD: So there’s lots of right ways? JH: Yes. It’s kind of funny... A lot of composers feel there’s only one way to do it, but I’m interested in hearing everyone’s interpretation. I really am. I find them fascinating. Sometimes people do things very differently than what I had written, but if they can do it in a convincing way, I’m with them. BD: Are there ever times that you want to go back and revise the score, incorporating these new little discoveries? BD: How much stretch is there before it gets to be too much and it’s no longer your piece? JH: That’s a good question. I have heard those moments where they stretch like rubber into something else that I’m not recognizing. That usually happens with less experienced musicians who actually need to take it more slowly because my stuff actually looks deceptively easy on the page, but it’s pretty hard. Some of the players were saying this won’t be hard at first, but then they start putting it together. It’s got its own challenges. BD: But you don’t write it to be hard? JH: No, I don’t. I’m writing it to just be musical and interesting, whatever my quirky rhythm thing might be. It sounds very natural to me, but I know for everybody else — seeing so many people struggle with the pieces — I always know where they’re going to have problems. There are certain rhythmic things that occur that I think makes the pieces difficult. BD: Do you ever think about revising the rhythm a little bit, to get the same idea a little technically easier? JH: To me, when it comes to the rhythm it feels like it would be compromised in the piece. I know it sounds kind of weird, and believe me, I know. I’ve had to play my own pieces, and I’ve thought, “Oh, my gosh! What the heck was I thinking?” But people always say, “You can’t complain. You’re the one who wrote it!” [Laughs] And it is interesting to watch. I don’t have any pieces that haven’t been played again. They all get done quite a bit, so it means I’m able to follow kind of the history of a piece. It is interesting to watch the different players take it up, and hear what they do with it. I find it completely fascinating. BD: Do you view all of these pieces as little children that are out making their own way? JH: Yes, and the older the child is, the less it seems attached to me. Do you know what I mean? I‘ve got a flute quartet from 1988 that gets done all the time, and that was so long ago, it seems, I can’t even remember writing it. It’s amazing. BD: But you’re pleased that it’s out there? BD: Is it four C flutes, or four different flutes? BD: I would assume it would be piccolo, C flute, alto flute and bass flute. JH: Yes, I know. That’s why I decided to do four C flutes. A lot of flute quartets are mixed flutes, but I decided to write a really intense piece with very close intervals, so the four C flutes work really well. That piece gets done all the time. It sometimes shocks me how much that piece is done. BD: If it has become a challenge, perhaps if you can do that piece then you’ve really made it as a flute quartet. JH: A lot of college groups will do it, and there will be individual students who are doing it for their junior or senior recital and want to play something with their friends. The piece has a lot of bite to it. I’ve played three of the four parts, and it is fun to play. I call it my atomic roller coaster ride. It moves at a real serious clip and it has these really complex rhythms. It’s only about four minutes long, but man, it’s a ride! It’s a ride and a half. Yeah, it’s fun. BD: A really short ride and a really fast one? JH: Yes, exactly. [Both laugh] Exactly, Bruce! You got it. BD: You write these pieces for specific people or even general people. What do you expect of the audience that is listening to it for the first time? JH: I’m often thinking about the audience. For me music has to communicate. That doesn’t mean hit has to be a certain tonal language, but I’m constantly thinking if this is the most effective way to talk to the audience. So they are in the back of my mind. I usually think first of the performers, because I know that I’m going to have to go through them to convey the message to the audience. Having been a player myself in a lot of situations where I’ve done new music, I know how hard it is sometimes. You want to make sure the players are getting something from all the work they’re putting into the piece. We’ve all played pieces before that we said, “Ugh, I just worked 16 hours on that, and boy, it didn’t feel like it was worth it.” So I do my best to make sure it’s a worthwhile musical experience. BD: What is it that makes a piece of music — either your music or other music — worthwhile? JH: I often think about that because there’s something I do instinctively pondering this, and I’m always trying to figure out what that is. What is that quality that makes it worthwhile? I’m always aware that people like interesting lines. I often think about what it’s like for the people who play the off-beats in Sousa marches. 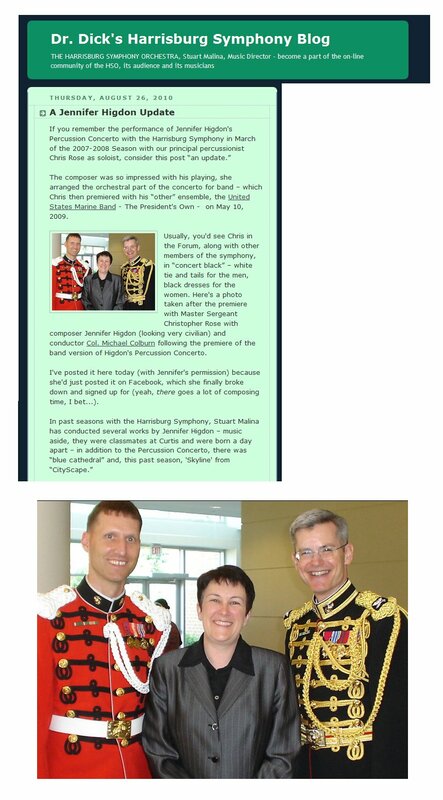 I have a couple of friends who played in the President’s Marine Band, so they are always doing things like that. BD: The French horns are always off the beat. JH: I know! I was talking to a French horn player just the other day about this very thing. I’m very aware that every line I write, whether it’s the solo or it’s some principal line, or maybe it’s just the background line, every line has to be shaped to be interesting. It doesn’t matter how utilitarian it is. BD: And it still has to be within the general shape of the whole piece. BD: Is it better to go to the kids at Curtis, or would it be better to go to the Philadelphia Orchestra? JH: It’s the same thing. [Both laugh] It actually is the same thing, and I do corner some of the people in the Philadelphia Orchestra. But because I teach at Curtis, it’s much easier to corner the kids at Curtis. BD: I understand, but a professional player who has been doing it for twenty or thirty years might know a trick or something. JH: Right. It’s interesting, though, because the Curtis kids tend to be more open. They don’t bring to the experience the bias like the orchestra members, so I guess there’s pros and cons both ways. But because most of these kids study with Philadelphia Orchestra members, I figure I’ve got myself covered. [Both laugh] And then a lot of times if I’m writing something for a younger group, I’ll actually go to someone who’s less experienced because I need to know. They’re perspective is going to be really different; it really is. So I think a lot about who I’m writing for. It’s important. BD: You were talking about shaping the lines and shaping the big picture. When you start out writing the piece, do you know the shape of the whole thing, or does it take shape as you are writing? JH: I usually know pretty much what the shape is, and then the details work themselves out as I am writing. I often start in the middle of a piece. I don’t always start out at the beginning. BD: You simply know that this section belongs in the piece? JH: Yes. I have done a lot of sketching, and I’ve also ended up not using ideas. Some pieces come to me that are very clear, and some pieces I’m a little more in a fog. When I was writing this Philadelphia Orchestra piece, the piece was so big! It was a thirty five minute piece, and it took a tremendous amount of sketching to get the details worked out. But when I wrote a piano trio a year ago, it was a lot more clear. Maybe that was because it’s a much smaller piece; it’s only three instruments. So every piece is a different degree. I don’t actually don’t use a regular form. It’s all through-composed. That would be the technical term for it, but I sometimes want to draw out things and find what the shape is dramatically and where are things going to happen. Then I listen to the music to see if I’m achieving that. If it goes against what I’ve first come up with as an idea, I go with the music. I don’t follow the graph or the drawing that I’ve written. BD: Fifty years from now, will the theory text say this is the Higdon Form? JH: Golly, that’s a scary thought! [Laughs] I hadn’t thought about that! I guess it could be. Or they’ll ask what was she thinking? [Laughs] I studied with George Crumb at the University of Pennsylvania, and he told me, “The answer really is always finally what you’re hearing. The true test is what you hear with your ear.” So I thought to myself if that’s the final test, why don’t I just start at that point? So I tend to follow my ear. I write instinctively, which is impossible to explain because how do you explain instinct? It used to make my teachers a little crazy, because school is geared in the other direction; it’s geared in a theoretical study of form. BD: Do you feel that you are a part of any kind of musical lineage? JH: Yes I’m sure I am, but I have such a bizarre background leading up to my career in classical music that I’m not actually sure. It’s been funny to watch the press reviews. Everyone is trying to figure out where to put me. The lists of composers the people are saying I’m like cracks me up, because they are not related. One guy in the Washington Post mentioned four different composers in review — Messiaen, Steve Reich, Lutosławski, and Stravinsky. JH: I’m like, my gosh! That’s basically okay; we got an entire array of the twentieth century here. That’s a lot of different styles, a lot of different languages, a lot of different rhythm. BD: That’s not a line, that’s four corners. JH: Exactly! So we’re talking a huge picture, and I wondered what is he trying to get at, what is it that he’s trying to find, what it is he’s hearing? BD: Do you want to fit into a line, or do you just want to just be you? JH: I just want to be me. That’s probably the more accurate description. I didn’t grow up around classical music, so for me line probably doesn’t have as much meaning, or I don’t feel the context I’m working in as much. Maybe because I write so much music I’m always thinking how I can make this piece better. I’m always focused on the music, and I never think about historically what is happening. Maybe it’s better that way, though. The weight of history might be a little bit of a daunting experience. BD: Then the obvious question is how did you get into it? Where did you come from, and how did you get into the classical side? JH: I grew up listening to rock and roll. We didn’t have classical music around my household. My dad was a commercial artist who worked at home, so he always had the music of the 60s and 70s playing. Simon and Garfunkel, The Beatles, Kingston Trio, a lot of reggae. This was before reggae was hot. He had lots of those sorts of recordings. So, it was probably folk and rock and Rolling Stones. BD: So why aren’t you the next Joan Baez? JH: That’s an interesting question. I’m not sure what happened. JH: I know! Yes, I am the black sheep of the family. Because I went into classical music, I am completely, totally, the black sheep of the family because my parents have been to a lot of rock concerts — probably more rock concerts than classical music concerts. There just wasn’t much classical music around. BD: So is this your rejection of their ideas? JH: It might be. It actually might be! I know it sounds really funny. BD: Perhaps that means there is hope for classical music because all of these parents are listening to rock, but everybody can reject them and come back over to our side! JH: It’s true! Its very interesting because it occurred to me at some point that I actually come more from the musical background than most. I don’t mean, necessarily, classical listeners, but anyone who listens to just music in general. I come more from that background than I do from people who just listen to classical because I didn’t grow up on it. A lot of people say they think my rhythm is influenced. I’m having to listen to what other people are saying because I’m too close to music to be able tell what is happening that people are responding to. A lot of people think that my sense of pulse and rhythm is probably from the amount of Beatles I listened to growing up. I would have to say that probably was the biggest influence for me. Every day of my childhood I must have listened to some sort of Beatles recording, and I think that probably did influence me. But how the heck did I get into classical music is really a good question! BD: Does that help your music speak to others who grow up that way? BD: Are you going to use it? JH: That’s a good question. BD: It could become Variations on my Childhood. JH: [Laughs] I might have to do that. So I realized something must have been in my head. When I discovered that, I thought there’s no way a kid would be writing this at six or seven years old with no background.” We had a flute laying around the house and I always was aware of the power of music, but I was always doing other creative things. My brother and I used to make 8mm animated films. My Dad had an 8mm camera, and we used to do like little claymation things. And I used to write a lot, literary stuff. He and I used to draw and paint, so I was always doing those sorts of artistic expressive things, the kinds of things kids normally do. At some point I picked up this flute and taught myself to play, which, now that I think about it, was a late start. At Curtis where I teach, everyone started at age two. Everyone was a baby when they started. I started teaching myself to play at fifteen. So I didn’t really get any kind of musical instruction, and when I started college, at the age of eighteen, I didn’t know the Beethoven symphonies. How many people do you know who work in classical music didn’t know the Beethoven symphonies at eighteen? Now that I’m saying it, it sounds completely ridiculous. BD: But it gives you a different perspective on the whole thing. JH: It does, and what I used to think was a disadvantage, I now think might have been an advantage. It was pretty hard going through school because they expect you to know that stuff. You have to have it, especially at the doctoral level. People were passing the ‘drop-the-needle’ exams quickly, and I was trying to learn the stuff. So it may have slowed me a little bit, but now I think it might have been an advantage. BD: I would think approaching a symphony late like that, with all of that experience, will give you a whole different outlook. BD: For you a trio is piano, bass and drums. JH: That’s it, exactly! So I’m going to Tower Records and I’m buying trios. I didn’t know a single solitary piano trio. It’s kind of neat having the knowledge I have now to actually be able to explore these things. I get really excited that I know it’s got to be totally different than for my colleagues who have known those pieces since they were teenagers. BD: This will make a wonderful doctoral dissertation sometime to look at your trios from a fresh perspective. JH: Yes. There’s a student actually in Philadelphia who is doing a doctoral dissertation right now on a couple of my flute works. When I start thinking about these things or when I do the interviews with people, I’m like, “Yeah, why does that happen that way?” I have to really think about it. But it’s such a bizarre beginning, it probably has really affected my whole approach. BD: With students doing doctoral dissertations, does that make you feel old? JH: Yes, it does. It’s really strange. I keep wanting to say, “Are you kidding? [Laughs] Are you crazy?” I mean, it’s totally funny, because I realized the other day that I just graduated with my doctorate ten years ago. I didn’t realize the proximity of this occurring. I’ve only had one other person do a doctoral dissertation on one of my other flute pieces. The flute players were aware of me before, because that’s the early stuff that I was writing and the instrument I play. BD: So, have you had a good decade? JH: It’s been an amazing decade. I have had the most amazing ride, and the trajectory has been unreal. I have to admit, I’m still trying to adjust; it’s been moving at such a clip. JH: I don’t know. Is it possible for it to be too fast? Ask me that in ten years! [Laughs] It seems like a pretty joyous ride right now, and I have to say, the level of performances! This year alone I have maybe forty orchestra performances, and I’m averaging around 120 performances a year. JH: It’s a staggering number. BD: You must be doing something right. JH: I guess so. I know. Really. BD: When you write a piece of music, do you feel it should be for everyone? JH: Can it be for everyone? I’m writing for some people, and I know it won’t be for everyone. My parents were so involved in experimental arts stuff when I was growing up, that I got a chance to see a lot of good stuff but also a lot of junk. I also came to realize early on that there’s no way that everyone’s going to like what you do. There’s just no way. There are a lot of things that I hear that I don’t care for, but I respect that the person did it. So usually when I’m writing, it’s always with the realization that this will work for some people and it won’t for others, and that’s okay. It’s a little less stressful, looking at it that way. Maybe it’s being the child of hippies in the sixties and seventies, and seeing so many of these bizarre arts happenings. We were living in Atlanta at the time, and really there was a lot of strange stuff going on. But I got all of my experimenting out of my system early on. I swear, I did! [Both laugh] I saw so many bizarre things and heard so many bizarre musical ensembles that went with these experimental animation and film festivals, that it kind of satiated my soul for that. So rather than thinking about creating a new sound, I’m often thinking about just what’s interesting and what will make something good. BD: With all of these commissions, are there still some pieces that you just want to write and have to get out of your system? JH: Fortunately, the commissions have fit with that. Somehow it’s all jiving in my head. People often ask if I ever write something just for myself, but I have to admit I’ve been so fascinated with the commissions I’ve been given, that I find those challenging and engaging enough that I haven’t felt like I’m missing anything. About two years ago someone approached me about doing a piece for orchestra and juggler. They were saying, “This guy can actually play rhythmically. He can throw things and bounce things.” I thought about it, and there was actually nothing appealing about it! So I decided to pass on that. BD: The only thing I think of which is close to that would be the Morton Gould Tap Dance Concerto. JH: Yes, exactly. I think there is a typewriter piece I heard once [The Typewriter by Leroy Anderson] and maybe some day that juggler thing will appeal, but I have to admit right now, it doesn’t appeal in the least. BD: We’re kind of dancing around it, so let me ask the easy question straight out. What’s the purpose of music? JH: I think it’s to express the human condition and really to express the soul. I really do. It expresses the human condition on so many levels because there are those angst pieces and there are those pieces that sound like ecstatic joy. There are the relaxed pieces and there are the uptight pieces. It’s such a perfect reflection of life and the soul, and yet the people who are listening don’t have to know a thing about it. Usually while I’m writing, that’s one of the things I think about. I know there’s been a lot of debate in the twentieth century about the fact that maybe people don’t understand it because they don’t know about this or that type of music, but I have to say my approach is I don’t think you should have to know anything about my music, or anything about music in general, to enjoy it. It should still be an enjoyable experience. But I look at music as a mirror. It’s a mirror of everyone, everything, our society, people. I often think of it as a mirror of people, though. I know some people think of it in terms of objects. I know Ravel used to talk about factories all the time, and clock-making, but I often think of it as people. BD: Is your music a mirror of you, or is all music a mirror of everybody? JH: I think all music’s a mirror of everyone. I don’t know what my music’s a mirror of. It’s probably of other people, but there’s probably certain pieces that are more a mirror of me. BD: You’re not using music as self-analysis, are you? JH: Sometimes it feels like self-analysis. About five and half years ago I lost my younger brother. He passed away, and to compose in the years after that was the most therapeutic thing. You can tell that there is something about those pieces, so, self-therapy? Absolutely. It was easier for me to get through the grieving process having music to express it. Blue Cathedral on that Rainbow Body disc was written for my brother. 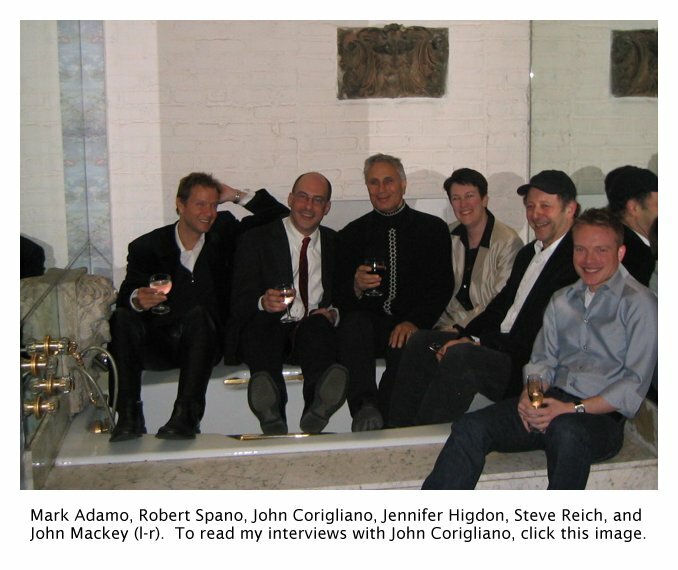 I was writing a lot of those pieces at that time and they helped me deal with it tremendously. So it is kind of a self-analysis, kind of a working it out in a way, but certain pieces of mine seem completely like reflections of other people. Then other pieces feel like they have more of me in them. It changes from piece to piece. That keeps it interesting, at least. BD: A number of your pieces of yours have been recorded, and more and more are coming all the time. Are you pleased with the recordings that have been made of your works so far? JH: Oh, yes, absolutely. I’ve been really pleased. I’ve been so lucky to work with superb musicians. I’ve had more than the normal share of spectacular performances, and I have to say working with the Atlanta Symphony and Robert Spano has been just an incredible experience. BD: Spano was your teacher for a while? JH: Yes, for a year. This was so funny. It was his first year out of Curtis, and we bumped into each other in Bowling Green, Ohio, of all places. So I’ve known him since ‘85! I had Conducting with him for a year and it was amazing! It was incredible. He’s one of the best teachers I’ve ever had. BD: Does that help you in getting your music looked at by his eyes? JH: I don’t know if it’s because of that, but neither one of us did anything about it. He just started conducting my music four or five years ago. I had never really sent him anything. I’m real shy about imposing on people. I don’t know what it is. It’s so hard for me to go up to him and ask him to look at something. I know him really well, so you would think I would be a little more comfortable. BD: But don’t you find it better if the music stands or falls on its own merit, rather than you pushing it? JH: Yes, that’s it exactly. My whole philosophy has been that the music needs to sell itself, and no matter how much I’m going to pester people about it, they don’t have time to look and listen to this stuff. If they’re interested, they’ll ask. Robert came to my music, actually, even after we’ve known each other after all this time, by a weird fluky thing. Blue Cathedral was commissioned by Curtis, and he happened to be the conductor who was engaged to conduct that specific Curtis Symphony Orchestra concert. It was completely accidental. I’m not even sure the people who had scheduled them realized that we had known each other. That’s when he started doing my music, and that was in 2000, so it’s actually fairly recently. BD: Obviously he likes it. He must think these are good pieces. JH: Yes, and he commissioned something, actually. The disc that’s coming out in March has Concerto for Orchestra, which the Atlanta Symphony did an amazing job with! Also included is a piece that they commissioned which is like a full-length symphony. So the disc is all my music. Wow! It’s all my orchestra music, and that’s big. It’s amazing! BD: When you get through with that, then, do you want to go back to a flute sonata? JH: No, no flute stuff. I’ve done enough of the flute stuff for a while! BD: Well, something for a solo instrument. JH: Yes. Actually, I have to say, I enjoy alternating the different things. I don’t like doing a lot of one kind of thing. I like doing a string quartet, then an orchestra piece, then an organ piece. I like mixing it up. BD: Right now you’re composer in residence with a vocal group? JH: Yes, the Philadelphia Singers. BD: What’s it like working with the human voice? BD: Does that help or hinder when you’re selecting text? JH: I think it helps, actually, although there have been a couple of occasions where I’ve had to write the text. That was a little scary because I’ve had a couple of commissions that were really specific. I had this one commission where the couple wanted a piece that would honor — let me see if I remember this correctly — the winter solstice, Christmas, Kwanzaa, and Hanukkah. But finding a text that fits that kind of requirement? So I figured maybe I better write something. So I wrote kind of a spiritual text that kind of encompasses all of those things. It had to be a general sort of thing. Occasionally I’ll get ideas for words along with the music, though. A lot of times it’ll happen when I’m writing an individual song, but I’ll tackle anything; I really will. I’ll try it out. Last year I did something with Latin in it. That was an interesting exercise in trying to figure out how to set things syllabically. BD: Does anyone speak Latin anymore? JH: No, but there are a lot of sacred pieces that use Latin. So I had to go back and look at how other composers do it, to try to figure it out and make sure I was doing it correctly, putting it in the right place in the line. It’s really tricky, but it’s worth trying. It came out all right, so I can’t complain, thank goodness! BD: When your score is presented to an orchestra or a soloist, is it pretty clear so they can work with it, or is it littered with lots of little directions? JH: No, mine’s pretty clear. I always try to imagine what it would be like if I were at one end of the country and someone else was doing it at the other end, and I couldn’t get to the premiere or I couldn’t coach it. That happens on a fairly regular basis with me, so I try to make sure that everything is there that they need, as if I weren’t going to be there. I probably got that from George Crumb. He used to talk about that all the time, notating very carefully so that you are conveying as much as you can. Also, its good for the performers, because when they go in to practice these things, they are very shy about calling the composers and saying, “What did you mean by this?” So I try to give them as much information as I can without overloading them, but enough that they can find their way and try to answer their questions. I try to anticipate what it is they might need. BD: Is the internet maybe throwing another joker into this because it might be a little easier to email you, rather than pick up the phone and call you? JH: They’re shy; they won’t do it. It’s amazing. I often send notes with pieces. I have said, “Now let me know if something doesn’t work, if it feels awkward, if you have a question,” and I don’t hear from people. Then if I go to wherever it is being done, I’ll say, “So how’s it going?” and they’re like, “Well, I wanted to ask you about this one thing.” “Why didn’t you ask me before?” because they are trying to practice something that’s awkward. People are really shy. BD: I assume, though, that it does please you that a lot of people are taking up your music. JH: Oh, yes! I can’t tell you how thrilled I am. Actually I’m kind of amazed because the music is hard. It’s impossible to take up my music without having some serious commitment that you’re gong to have to work on it, because there’s like no getting around that. BD: Would it surprise you if you heard it in the elevator of this hotel? JH: It would. That has happened to me before! [Laughs] I almost wrecked the car in Atlanta when Blue Cathedral came on the radio. I just had the radio on, and suddenly it was like, my gosh, that’s my piece! It’s happened every once in a while and it always surprises me. I usually run into the furniture or walls when it’s happening, I get so distracted. It’s totally funny. That’s pretty amazing, though. It’s a pretty privileged place to be, because there are so many composers out there, and they’re good. They just haven’t had the same kind of breaks I’ve had. Some of it has been just literally being at the right place at the right time. That’s definitely part of it. BD: You’re doing some teaching at Curtis. Is this composition, or flute, or what? JH: Just composition. It’s not a lot. We have a pretty small studio there. I’ve got three students so it’s a pretty miniscule amount. BD: What kind of general advice do you have for those, or other students? JH: Every one of those students is different. Composition is such a difficult thing to teach. It’s not like when I was taking flute lessons and we are all taking the Prokofiev Sonata. There are just certain ways to do things, to articulate, to observe the dynamics or marks. But trying to get a student out of themselves from nothing is so difficult, which means everyone has different creative blocks. BD: The Prokofiev Flute Sonata you know is there. In their own music, you don’t know whether it’s there. JH: Is the student thinking of all the possibilities of what they’ve started with? It’s a game of detective work. Each student is different. Everyone needs something different, but I try to give them as many different ways of looking at something as I can, because that’s the problem they’re going to have when they leave any kind of teaching studio. They need to know how to solve their own problems. I vary it. If they’re the kind of student who writes a lot of music real fast, I’ll try to get them to slow down. I try to get them to try the opposite of what they are used to, just so they can see what it feels like. JH: That’s it exactly. It’s kind of funny. BD: What advice do you have for audiences who hear your music — just come? JH: Yes. That’s it, exactly. You don’t need to have any preconceived idea about my music. You don’t have to know a thing about classical music. Just come and hear it; I think you’ll enjoy it. This I say after watching audience reactions for years now. I’m starting to realize that the music actually works, and you don’t have to know anything about classical music. I’ve had an awful lot of people who’ve written me letters and emails after concerts. This is really sweet. I get emails all the time from people who are saying things like, “I only like Bach, but I like your music.” That’s just like an incredible compliment if you can speak to someone like that. Wow! BD: That means you’ve touched them in some way. JH: Yes, which is just the ultimate compliment. It really is. Sometimes people come from the audience who can’t speak because they are teary. I’m often amazed by that, too. That’s an amazing thing to have in a lifetime, to be able to do some sort of art form that moves people. BD: Is that scary to know that some of these little dots and squiggles you put down are really going to touch people? JH: Yes, it is scary, actually. Sometimes it’s kind of an awesome responsibility. I’m aware of it. It’s true, but I’m always aware that I have a certain responsibility in creating an art form. Because I have the opportunities, I know that I need to make the most of them. I’m constantly going through other composers works and trying to find things that I might be able to pass along to somebody. I’m always doing that, and I find it fascinating to hear what other people are doing. That’s the other thing I love. BD: You’re trying to keep up. JH: I’m always in Tower Records buying things, and people send me CDs all the time. So I’m always listening to those and seeing what people are doing. Sometimes I’ll get calls from orchestras asking, “Do you know anything from a young composer that’s seven minutes, that’s kind of fast?” Because I judge competitions and things, I run across things. You go through several hundred scores and recordings, and occasionally you’ll run across a real gem. So usually I’ll contact the composer to see if I can get a copy. Also, the kids at Curtis are having to apply for competitions and things, and sometimes there are requirements; they’ll need a violin piece that’s from 1995. So they’re looking for things specifically, and sometimes I’m aware of a piece that I can pass on. BD: Put it on a page your website. JH: That’s a good idea. That’s a really good idea. I hadn’t thought about that. [Laughs] I’ll have to talk to my website guy. That’s great, Bruce. That’s actually a really good idea. I don’t maintain my website because I just can’t. I don’t have enough time to do it, but I have a flute friend who does, and it’s good having him. I’m amazed how any people access that website to find information! It’s invaluable. Those things are just invaluable! It’s incredible. It has changed music, really, because now you don’t have to be with a publisher. You can do it yourself because people can find you. That used to be one of the battles, so I think it’s altering it a lot. It really is. BD: I’ll meet you back here then. BD: Just for my records, may I ask your birth date? JH: Yes... New Year’s Eve, 1962. December 31st is kind of an odd time to have a birthday. It means I’m always a year older. I look a year older than I actually am because everyone always calculates by the year you were born, ’62, so I just turned forty-one. But it’s kind of an interesting time to have a birthday then. I don’t forget it. BD: Plus it gives you an extra tax deduction that year. JH: It’s both fun and agonizing. Parts of it are joyous and parts of it are just agony! It’s amazing how hard it is, and I don’t think it gets any easier. It’s hard; you’re always worrying. You think this isn’t going to work! This isn’t going to work! And sometimes I think it’s not going to work right up to the performance. It’s amazing how often that happens. I was really encouraged when I read something recently. John Adams said that every time he hears a piece of his for the first time, he is always horrified. Wow, that’s encouraging! I always considered John Adams to be a real pro at handling things, but to hear him say that made me feel a whole lot better. BD: I would think you would be relieved when your own piece worked! JH: I am, but my music is hard enough that I sometimes have a little bit of anxiety of what I’m putting people through. I also know that my perspective of hearing is not going to be what the rest of the audience is experiencing. I know the spots that I’m worried about, and I swear I have some sort of reaction when they are going through the music. I’m like, “Will this work? Will this work?” and I’m sometimes really caught off guard by whether it works or not. I’ll ask musicians, “Do you think this works? Does it feel all right?” Sometimes it is a pleasant surprise though; it really is. It’s a hard job, but I can’t live without it, so I’m not exactly sure how to answer the question. I need it; I really need it. I have no choice, but boy, sometimes it‘s real agony. BD: As my old teacher Tom Willis, the Music Critic for the Chicago Tribune used to say, we all work to support our habit. JH: Isn’t that the truth? It really is. BD: I’ve got some recordings of some of your compositions and also your flute playing. Are there some recordings of your conducting? JH: Actually only on someone else’s recording. Robert Maggio, a composer from Philadelphia, has a piece that came out on CRI. Probably if you typed me in on a place like Amazon, I think it does pull me up as a conductor. But I’ve actually curtailed my conducting stuff because Spano made me realize that if you are going to get up on the podium, you have a real responsibility to know what you are doing. It’s almost impossible to learn the scores like you really should know them and still maintain the amount of composing I’m doing. But I’m sure at some point I’ll probably get back to it. I’m sure I will. BD: Will you keep up the flute playing? JH: Yes, that’s a little more consistent. I am also running my own publishing company. It’s a lot of work. I’m still trying figure out how to balance that with so many performances going on in a year. JH: Yes, although this year I am struggling a little more than I normally do. I carry a laptop around so I can work in hotel rooms! I worked on the plane all the way down here from Philly to Chicago. I actually spent the whole time composing ‘til they told me I had to turn the computer off. I’m trying to clear out a little more time so I’m not so squashed. It’s maybe more healthy creatively. BD: Maybe sometime you’ll just have to take a few months off. Build it into your schedule. JH: Yes, I think that’s what I’m going to have to do. I think you’re absolutely right. BD: Go sit on a beach for a month. This conversation was recorded at her hotel in Chicago on February 14, 2004. Portions were broadcast on WNUR later that year. This transcription was made and posted on this website in 2014.